If visiting Laos you are likely to arrive from neighbouring borders, Vietnam on the East or Thailand on the West. Two countries which influence Lao food in a big way. In fact most of Lao food staples are similar or the same as that of their neighbours. Influences of Lanna Food (Northern Thailand), Isaan Food (North East Thailand) and Vietnamese food (Vietnam). Food in Laos little more than a mix of all three. Arguably done better on the opposite sides of Lao borders but that being said I do still look forward to eating in Laos. Coming from Thailand I am excited for the Vietnamese food and colonial French influences. If coming from Vietnam I would likely be excited for the opposite of Thai and Isaan favourites. This post is aimed at those arriving from either. Our Top 10 Lao Food for essential eating in Laos. Some of the better food cities to eat in Laos include Vientiane, Luang Prabang and maybe Pakse. This top-notch noodle dish is probably the most common of Lao food and is a staple not so different to Pho which is synonymous with their Vietnamese neighbours. While common as breakfast Khao Piak Sen also makes good for lunch and pretty much anytime of the day. This tasty soup bowl generally comes as Beef or Chicken served in like broth over flat rice noodles and flavourings of fresh herbs. Often accompanied by optional garnish of chilli oil, lime juice, bean sprouts, long beans, holy basil and cilantro. Khao Piak Sen costs roughly 10,000 Kip or 40 Baht. 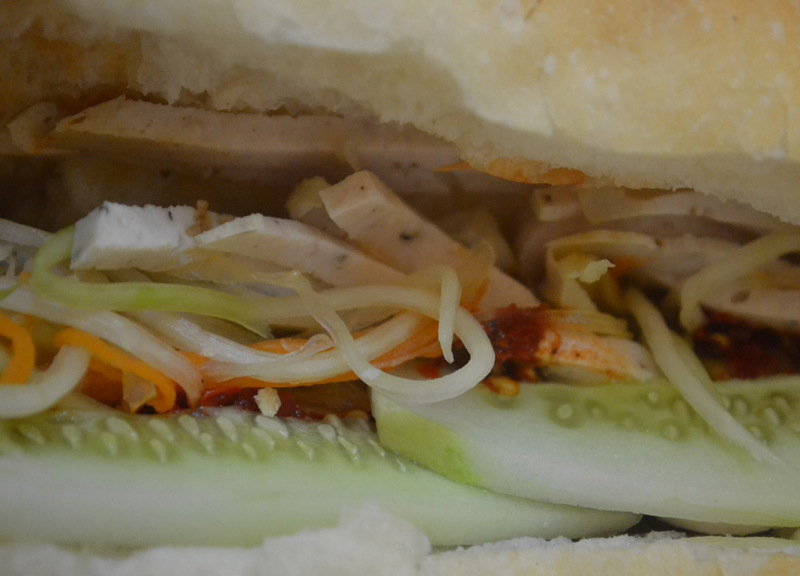 The French influence doesn’t come more obvious than Khao Jee which, in short, is a crusty French baguette. Khao Jee is one of Laos’ staple street foods found sold at small, street side stalls in every city. As with all baguettes you can put pretty much anything in them. The popular filling in Laos however is a set filling of pork liver pate, Vietnamese sausage (boiled pork, cha lua), shredded radish and carrot, cuts of cucumber and squeezes of mayonnaise and chilli sauce. Khao Jee costs roughly 10,000 Kip or 40 Baht. While famous in Thailand’s Isaan region this fiery, minced pork salad originates from Laos. Easily one of my favourite foods in Asia and a must try for any visit to Laos (or Isaan). While Laab does have variations the most popular dish comes with stir-fried minced pork cooked with shallots, coriander, chillies and mint leaves. Salty of fish sauce and sour of lime for seasoning. Note, Laab can be found using raw uncooked meat which I strongly advise against eating. As most of Lao food Laab comes served with sticky rice (Khao Niew) an accompanying staple. Laab Moo costs roughly 20,000 Kip or 80 Baht. If coming from Thailand you should be familiar with Som Tam. Tam Mak Hoong is the Lao equivalent although the term Som Tam is easily interchangeable. This fiery green papaya salad brings the signature sweet, sour, salty and hot signatures of the region. Tam Mak Hoong easily recognised by large mortar and pestles and bright red tomatoes. In the large mortar and pestle strips of green (unripe) papaya are crunched together with a handful of basic ingredients including palm sugar, lime, fish sauce, peanuts and chillies. 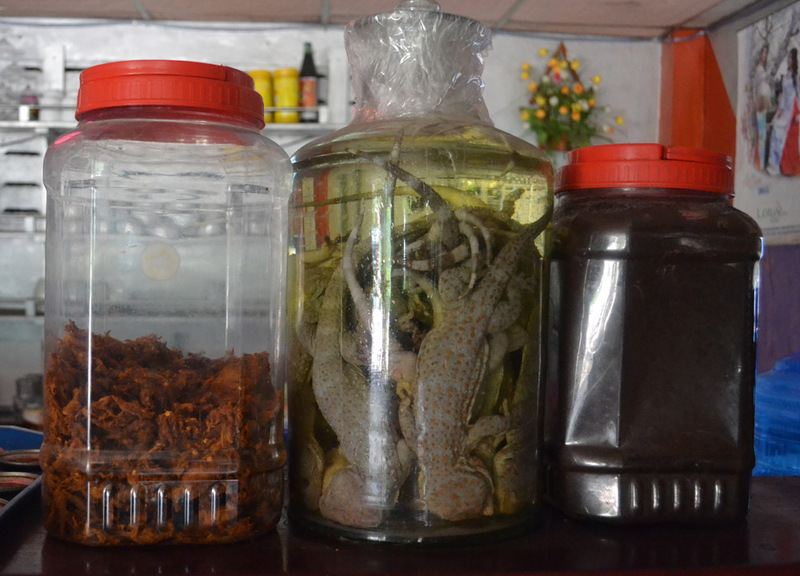 Other optional Lao ingredients include soft-shelled crab, pickled fish sauce (padek) and Makok a sour olive shaped berry. Eat with sticky rice. Tam Mak Hoong costs roughly 10,000 Kip or 40 Baht. The Lao Sausage is not so different to the famous Chiang Mai Sausage next door in Thailand (Lanna Food). A meat treat which fuses the regions signature flavours with sours of lemongrass and kaffir lime and the fiery kicks of chillies and galangal. Fused together with minced pork and pressed into skins. Lao Sausages can often be seen drying at roadsides or strung up at local markets. Unlike the Sai Oua of Lanna Thai food the Laos Sausage comes served with a tasty dry chilli dip (Nam Cheo) and of course sticky rice. A serving of Sai Oua costs roughly 20,000 Kip or 80 Baht. 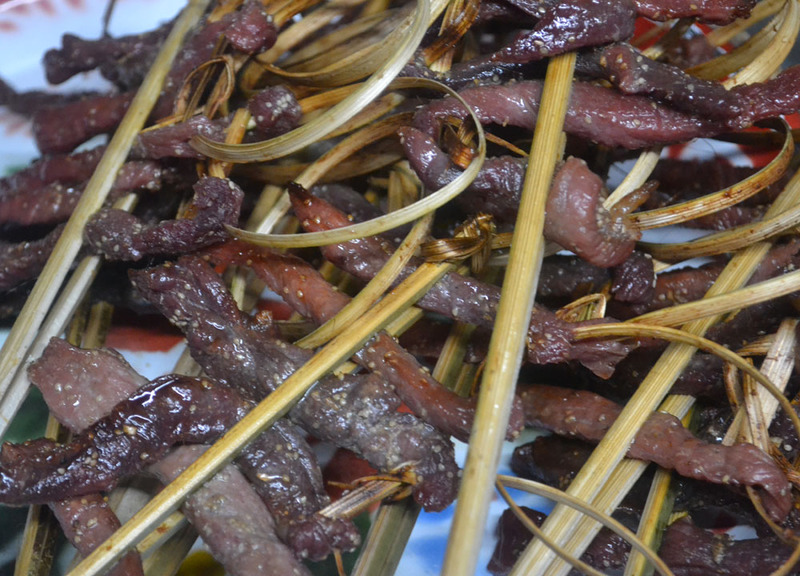 The Lao equivalent to beef Jerky. Not overly exciting but Sien Savanh do make great for nibbling on travels and are often found at bus stations or pit stops along the way. Sien Savanh are small bites of beef, marinated in dark soy, oyster sauce, garlic, pepper and palm sugar. Occasionally with sprinkles of sesame seeds. The marinated beef is left to dry in the sun, catching rays to find the perfect glaze. A quick grilling at roadside street food vendors adds a smokey flavour and the result is a chewy, sticky, nibbletastic beef snack. Sien Savanh come hand-in-hand with a bag of sticky rice and if lucky a spicy tomato chilli dip (Jaew Mak Len). A quick bag costs 10,000 Kip or 40 Baht. One of the most sought after beers in Southeast Asia, a favourite with Southeast Asia’s backpackers and now found exported through Europe. Beer Lao is hard to avoid in Laos and is said to have 99% share of the beer market in Laos. It is everywhere and as far as beer goes it’s not so bad. If bored of the regular Beer Lao (as you will be) you can always try Beer Lao Black brewed with a roasted malt or Beer Lao Gold more expensive but not more delicious. Big Bottles of Beer Lao (640ml) cost roughly 10,000 Kip or 40 Baht. Perfect for sunsets on the Mekong. neighbors in the west (66 millions Thais) and east (92 millions Vietnamese). But you somewhat ignored the history of the region and, especially the reality of Lao food. Lao food is defined as the food of the ethnic Lao people in both Laos and Northeastern Thailand (Esan) and is different from the Thai-Siamese and Vietnamese food. The Lao food defines Lao people. Did you know that the Esan region used to be part of a former relatively peaceful and prosperous Lao Lan Xang kingdom for several hundreds of years until the early 1800 when it was lost to Siam? Most people there had been depopulated from the eastern side of the Mekong, but they still have similar food, music and cultures as the Lao people in Laos until present days. Until 1975 when Laos fell under a communist regime, the Esan people were still called Lao Esan by central Thai before a successful Thaiification to counter a surge of communism in Laos and the Esan region. Vietnamese and Chinese food. Things are changing fast since tons of tourists have poured in in thousands. Traditional Lao dishes have been improved and advertised to tourists like in Thailand and elsewhere. Yes, you are right Lao food is influenced by Vietnamese food, especially Pho and Spring and Fried Rolls. Lanna food has more influence from Burmese and Lao food than vice versa. What is Thai food anyway? Most Thai dishes themselves have been influenced by Chinese food (mostly noodles), Indian/Persian food (curry dishes) or neighboring countries, including Laos. All told, Pad Thai and seafood dishes are what I find to be most delightful Thai dishes. Amazing. My article is a simplified list of Lao foods for passing tourists but that information is seriously impressive. Thank You. Oh, the name of blog is really interesting. We can live the way we like and don’t have to follow any social rules. I understand the meaning in that way. Am I right? And I certainly try dishes you mention in the list. Thanks for your post.